If you want a luxurious resort experience with zen-inducing Balinese design and nonstop ocean views, then you’ll fall in love with Love Pumpkin at COMO Parrot Cay. 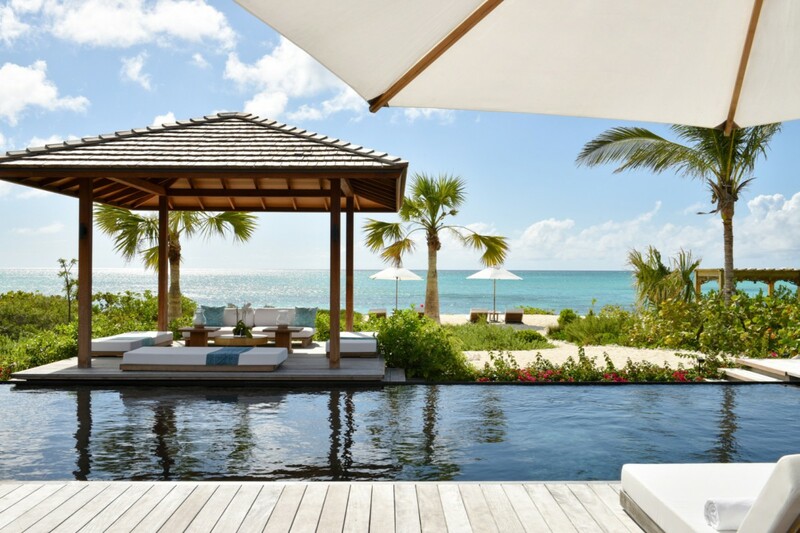 This villa sits on the coast of Parrot Cay, a small island off the coast of North Caicos. Since COMO Parrot Cay takes up the entire island, you’re guaranteed peace, luxury, and privacy. There’s endless resort activities for your entire party, and no crowds to battle. Love Pumpkin is set in the middle of COMO Parrot Cay’s western coast, facing the sea. Comprised of a Balinese-inspired Main House and Guest Villa, Love Pumpkin is a great place for giving large groups the chance to experience Turks and Caicos together. Take a short walk down to the 70 ft beach and lay out under the coconut palms. The bay has live coral and colorful tropical fish, and the villa has kayaks that guests can take out on the water. The Main House is set around an open courtyard framed with island greenery and dotted with lounge chairs. Watch the sun glitter off the sea from the Balinese gazebo or swimming laps in the heated, lava rock pool. The terrace touches the Main House’s main spaces, including the living room and both suites. Wall-to-wall sliding glass doors open the interior to the sea, and plush, oversized furnishings welcome guests to relax. The living room has a flatscreen TV and a dining table, with a blend of rustic and modern decor throughout the space. Walnut cabinets and stainless steel appliances add a warm, contemporary aesthetic to the gourmet kitchen, which is tucked away toward the front of the home. There’s a powder room and laundry room adjacent, out of sight yet easy to reach. The Main House’s bedrooms sit on either side of the central common areas, each with terrace access, a king-sized bed, walk-in closet, and an ensuite bathroom. Both bedrooms open to a glass-walled sitting area, and have Balinese accents throughout the bathrooms to create a zen, spa-like environment. There are several outdoor showers and tubs throughout the home for those who want to spend as much time as possible under the island sun. In the Guest Villa, the master bedroom and guest bedroom both face the ocean. To access the master bedroom, follow the stone walkway alongside the pool. Its ensuite bathroom can be opened to the courtyard, and the bedroom has a king-sized bed. The second bedroom has two queen-sized beds on a terrazzo platform. A small living area faces the sea and opens to the deck, which has a lava rock pool and spectacular sea views. Guests at Love Pumpkin will be pampered with twice daily housekeeping and COMO butler service. COMO Parrot Cay has water sports, tennis, fitness center, bars and restaurants, and running trails for guests to enjoy as they wish. There’s also a business center, meeting space, and wedding space for large groups. Welcome - Babysitting services and child-friendly menus are available.